FB - a brush, a maze without promise. Human ears lack quite easily their perception and if needed they follow rather what the brain remembers. 'We wanted to rebuild our lives, that was all. In order to rebuild one`s life one has to be strong and an optimist.' Nowadays refugees could help to rethink our lives here in Europe. Instead our fears dictate the situations. While i read a book i want to write a book. I get seriously unsecure and nervous when i think about the many people who refuse to vote. How do they imagine their future? Three meters of hanging cloth bale show the floorplan of Virginia Woolf’s "A room of one's own“ (using a drawing by Edith Friedl) and questions from Anja Westerfroelke were juxtaposed to quotes from this essay published in 1929. “A room of one’s own” has been turned into a slogan. More than 85 years later, it still covers and expresses women’s needs. Some women have read and discussed feminist texts, others have not. The situation of women in contemporary societies has changed. Or has it ? Books have been published, activists’ meetings organized, influential interviews recorded, where have they all gone to ? Where to keep the past and how to act for the future ? Women keep repositioning their perspective on life. Where to find the sentences, the analyses and the examples of their lives to shape it ? "How the room of ones own (Virginia Woolf) could look like?" shows a floorplan (drawing by Edith Friedl). Questions by Anja Westerfroelke are juxtaposed to the quotes taken from this essay published in 1929. At De Markten, Brussels audio-visuel art installations were shown in March 2006 with the theme 'A woman must have money and a room of her own'. Lectures, film screenings and Kafe-Kuchen discussions every Thursday went along with this exhibition. The installation A ROOM by Anja Westerfroelke provided the context for these encounters. On site in Vilnius, Lithuania, I came across the Church of the Sacred Heart of Jesus. During the Soviet occupation the Sisters of the Visitandines left the convent and the state authorities opened a prison in the buildings. 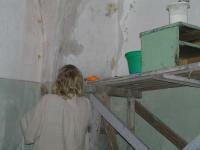 On the inside the church itself was no longer visible after the prison had left in 2007. During 2008 – 2010 I developed this site-specific Art Installation as well as exhibitions and performances for Vilnius as the European Capital of Culture of 2009. This project was carried out in collaboration with Marie-Françoise Stewart-Ebel, Brussels, while we investigated the relationship between art and culture. All my life i experienced enough and didn`t mind to forget. Therefor i will be not surprised if my mind starts to realy lose memory. Forgetting is more likly anyway than to remember. Only a machine crashes when the information takes over. As humans we got beautiful filters.